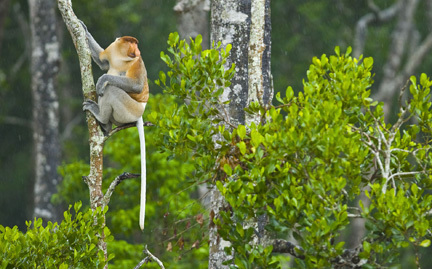 Preferring coastal areas and mangrove forests, proboscis monkeys are found only on the island of Borneo. Aided by webbing between their digits, proboscis monkeys are excellent swimmers and will leap from trees into the water, sometimes swimming deep under the surface. Hunting and habitat loss threaten proboscis monkeys.